1. Don’t script your language. You’ve prepped your anticipated questions, memorized your talking points, and mapped them all out, in order, on paper. You are ready to go! Or are you? The truth about TV interviews is that you never know exactly how or when your interviewer will phrase his or her questions. Because of this, it’s important that you think of talking points as a guideline, rather than a verbatim script. The more you try to stick to a script, the more robotic you will come across on TV. So, instead of memorizing words like an actor or actress in a play, know the top points you want to make during your interview and let them flow from your mouth naturally. 2. Remember that YOU are the expert. Perhaps one of the most stressful things about going on live TV is that you very rarely get a “practice run” with your interviewer. Because you don’t have time to rehearse, the reporter may not do everything “by the book” as you were expecting and could go slightly (or sometimes more than slightly) off topic. In this instance, remember that you are the expert and are there to talk about the content you prepared. 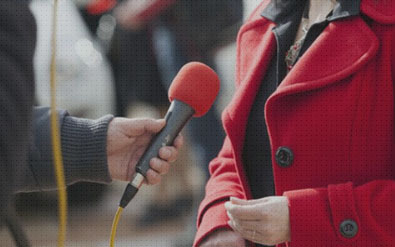 In the event that a reporter goes off topic, maneuver the conversation back to your area of expertise and the key messages you want to deliver. Don’t be afraid to take back control of the interview– you’re allowed! This one is simple, but very important. When you are on TV, it can be hard to ignore the “elephant” in the room – the camera(s). But that’s exactly what you should do. Don’t look at the camera! When you are being interviewed, pretend like it is just you and the interviewer(s) in the room, and let technology eavesdrop on your conversation. The only exception to this rule would be if you wish to directly address the viewers at home (very rare) or are guest hosting or co-hosting a segment. 4. Vary your vocal tone. Even if you have amazing, life-changing, Earth-shattering content to share during your interview, if you are monotone in your delivery, your message will not resonate with viewers. They might hear you talking, sure, but they won’t be actively listening. So, don’t be monotone – vary your vocal tone, change your volume level, and place distinct emphasis on key words or points during your interview. Think about being energetic and slightly animated in your delivery (but not over-the-top like a cartoon character)! 5. Be aware of your movements. Until you watch yourself back on TV, you might not realize that you were swaying or fidgeting during your interview. Don’t stress – this is actually quite common! But it’s also an easy thing to fix. Before your segment starts, sit up or stand up tall, evenly distribute your weight on both feet, rest your arms by your sides or clasp them together in front, and take a deep breath in…and out. Make this a routine before your interview begins so you are fully aware of your body and your movements. Swaying or fidgeting only distracts the viewer from the important information you are discussing. The best and most important tip was saved for last! Even if you are an experienced spokesperson, there is nothing that can prepare you better for a TV interview than practicing it out loud. A good PR professional will coach you through each and every TV interview you have, no matter your previous experience. He or she will approach the interview differently with you every time to help polish the skills listed above. Just like anything else, the more you practice, the better you get. If you have any questions or would like to inquire about TV appearances, media training or other PR services, please contact us at pr@msrcommunications.com.